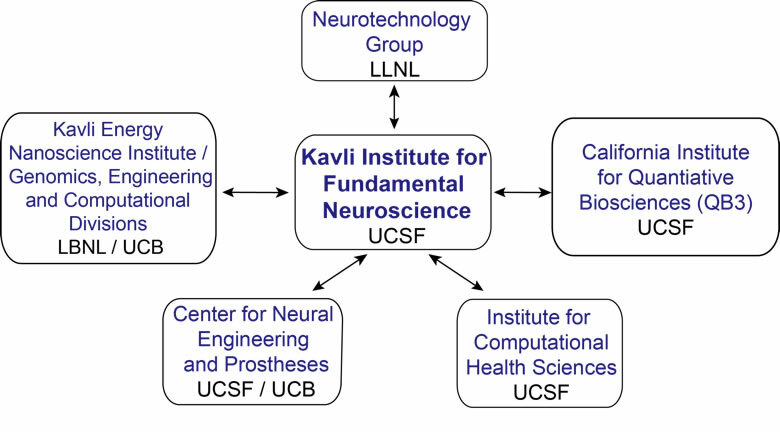 The Kavli Institute for Fundamental Neuroscience (Kavli IFN) is a central organizing force for neuroscience research at UCSF and our partner institutions. As shown in the diagram below, we are building bridges to colleagues in complementary fields both within UCSF and across UCSF and the Bay Area National Laboratories. Our goal is to help create and support new, cross-disciplinary teams of scientists and engineers to tackle the most challenging questions of neuroscience—elucidating the fundamental underpinnings of the brain and its adaptive capacities—while developing the technologies needed to address these questions.